Take off for an adventure at Professor Hacker's Lost Treasure Golf with the entire family for 18 holes of fun and excitement. One of the most unique places to play mini-golf in Pigeon Forge, Professor Hacker's Lost Treasure Golf offers 2 course of intrigue and adventure for the whole family to enjoy. Join Professor Hacker, noted explorer, archaeologist, anthropologist, paleontologist, and part-time taxidermist, on his latest expedition to the Fogclift Islands. With fascinating finds around each bend, this might be the most exhilarating round of miniature golf in Pigeon Forge you've ever played! After choosing the clubs and which color golf ball you'd like to use on your adventure at Professor Hacker's Lost Treasure Golf, embark on your adventure. Board Lost Treasure Golf's unique mining car up to the top of the course you choose (one course is handicap accessible) for the family's friendly competition to begin. As you wind your way down the course, carefully putt your golf ball through the challenging holes. With holes that go through cave and waterfalls, some of these holes will present quite a challenge to stay on par. Make sure to play your best at each hole. Every day at Professor Hacker's Lost Treasure Golf a special "mystery hole" is selected. If you score a hole in one at the designated mystery hole of the day, you get a free game of golf (as if you needed even more incentive to beat Dad at a round of mini-golf in Pigeon Forge). 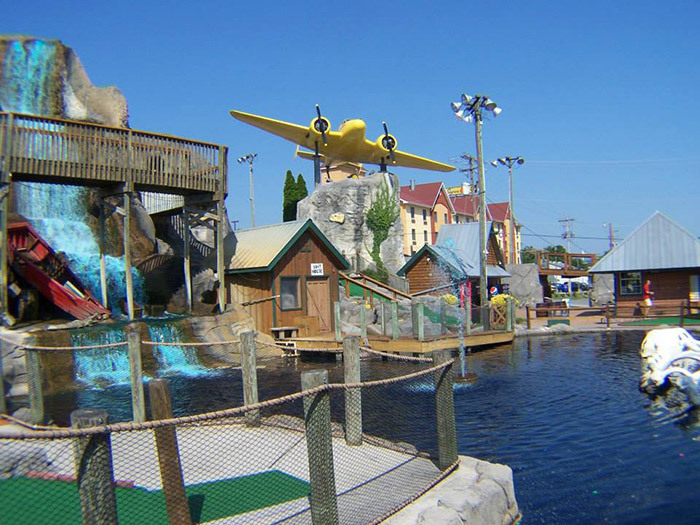 With waterfalls, volcanoes, an airplane, pirate ship, and more, you'll want to take your camera to capture some priceless family photos along the way as well.After you've finished your exciting game for miniature golf in Pigeon Forge, TN, tally up the scores and find out who can boast bragging rights of winning at Lost Treasure Golf. If a round or two at Professor Hacker's Lost Treasure Golf hasn't satiated your desire for mini-golf in Pigeon Forge, there are several other places to play miniature golf in Pigeon Forge. Try your hand at The Track's mini-golf course. Transport yourself to a land of dragons and mermaids at Fantasy Golf. Turn up the heat during competition at Firehouse Golf. There's plenty of fun courses to play mini-golf in Pigeon Forge! Stay Close to Professor Hacker's Lost Treasure Golf! A stay at one of Cabins USA's Pigeon Forge family-sized cabin rentals and enjoy both proximity to the area's top attractions as well as enjoy a quiet mountain retreat in the Smokies. Imagine coming home to a spacious cabin with a bedroom for all the kids after an action-packed day in the Smokies and a comfortable jacuzzi tub for you to unwind in. It doesn't take long to see why a cabin stay is the best way to enjoy a Smoky Mountain vacation.